Kodak announced four new cameras this afternoon, all to be showed off at this week's PMA conference in Las Vegas. Two EasyShare cameras were among the new releases: the EasyShare Z712 IS and the EasyShare Z885, both promising high ISO settings, image stabilisation and long zoom ranges. The Kodak EasyShare Z712 IS has a 12x optical zoom, 7.1 megapixels, optical image stabilisation and a short shutter lag of 0.26 seconds. It will be available in April for £229. 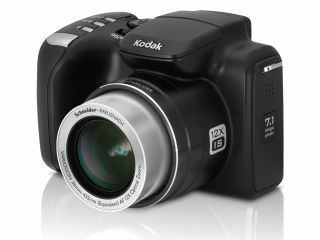 The Kodak EasyShare Z885 has a 5x optical zoom lens, and ISO up to 8000 for good performance even in low-light conditions. With an 8.1-megapixel CCD sensor and 10 preset scene modes, this model will cost £149 when it goes on sale in May. Kodak also revealed the 6.2-megapixel, 3x optical zoom Kodak C613 Zoom, and the Kodak C763 Zoom, which has seven megapixels and a 3x zoom lens. The Kodak C613 Zoom will cost £70 when it goes on sale, but pricing for the Kodak C763 Zoom has yet to be confirmed. The Kodak Easyshare G610 Printer Dock was also announced. Priced at £130, it will print 6 x 4-inch photos from an attached camera. Kodak is launching a battery pack to fit AA-format digital cameras as well. The batteries last up to four times longer than ordinary batteries, according to Kodak, and will cost about £12 for a pack of four.